Originally posted on Sierra County New Mexico’s tourism website. Balneology is used for numerous health benefits. Maintaining wellness is the primary goal; mineral waters revitalize the skin, calm nerves, detoxify the body system and refresh oxygen levels. For those with health issues, mineral water can have a positive effect on conditions like arthritis, fibromyalgia, depression, skin ailments, and respiratory illnesses including asthma, locomotor and circulatory diseases. 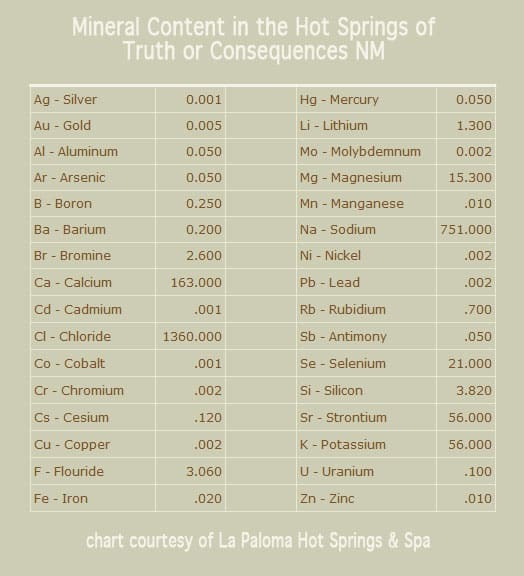 Anyone who takes regular soaks in the magnificent hot springs of Truth or Consequences already knows the benefits first-hand. Whether they suspect they’ve been healed of specific conditions or not, even if they don’t really buy into hot springs health benefits or curative qualities, there’s an undeniable sense of relaxation and well-being that comes after a soak. These waters just…make a person feel better. The field of Balneology is typically taught within the Rheumatology Department of medical universities, as well as actively practiced (with ongoing research of its efficacy compared to other treatment) throughout Europe and Asia – including but not limited to France, Switzerland, Belgium, Czech Republic, Hungary, Portugal, Italy, Germany, Poland, the Netherlands, United Kingdom, Turkey, Russia, Japan, Korea, and New Zealand. BANA’s mission is to support the research, information exchange, and education of the health benefits of natural mineral waters among the many different sectors that could benefit from the responsible use of natural mineral waters for health and wellness. Identified sectors include individuals, health specialists, educational institutions, spa health resort owners, insurance providers, and health policy specialists, as well as environmental protection services such as water quality, conservation, city & regional planners, architects, and landscape designers. BANA is committed to bringing national attention to the extensive history and future potential of using natural mineral waters for therapeutic benefits. They tout it as a safe, effective, inexpensive therapeutic practice, and a green energy source. BANA also supports the responsible preservation and care for natural mineral waters. Thanks for visiting Truth or Consequences and its hot springs, BANA!